Judy Garland and the Stonewall Riots have always been linked since that fateful day and night in June, 1969. Garland’s NYC funeral took place on June 27. 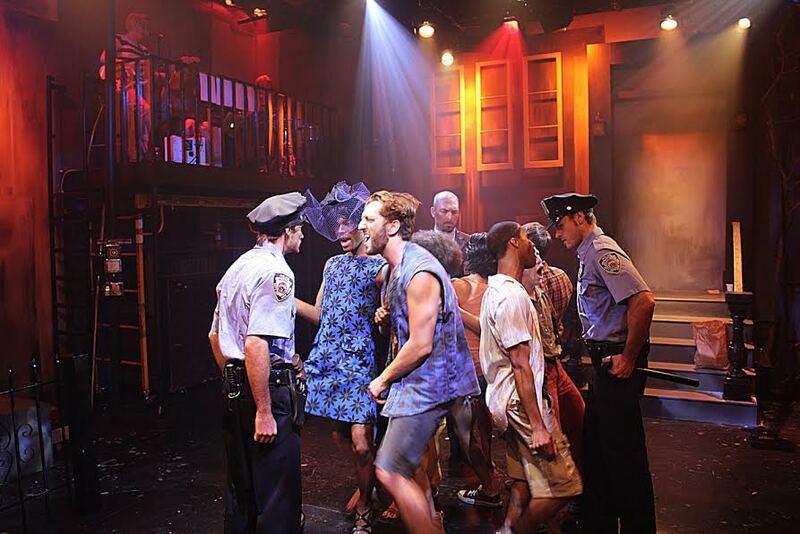 Later that night, or rather in the early morning hours of June 28, police raided the Stonewall Inn on Christopher Street, brutalizing the drag queens and lesbians who were not dressed to the NYPD’s specifications. It’s only fitting then that Ike Holter’s Stonewall play Hit The Wall, receiving its West Coast Premiere at the Los Angeles LGBT Center, starts with Carson (Matthew Hancock) in full drag singing along to Garland’s “Over the Rainbow” playing on the bar’s jukebox. Holter gets a lot right in his “remix” version of the historic event that led to the founding of the modern Gay Rights Movement. It would be difficult for any writer to condense all the personalities, all the motivations, all the subtext of the event into a coherent piece of theatre. Holter’s ten main characters run the gamut from trash talking street kids to uptight matrons, from drag queens and draft dodgers to brutal policemen. But they are mostly just mouthpieces for Holter’s stream of consciousness style of writing. For the most part his characters don’t speak like real people–they speechify at rather than dialogue with each other. They talk and talk and talk some more but you really don’t learn much about them. It’s a long 105 intermission-less minutes until the curtain call. Director Ken Sawyer’s inspired direction makes the piece a whole lot better than it is. The few minutes of the riot, done just inches away from the dispersed audience in the tiny playing space, is riveting. Unfortunately it is the highlight of the play and should also be its finale. Instead the play goes on for another 15 minutes or so of deadly dull and un-needed follow up scenes. Hancock leads the cast as the defiant and grief-stricken Carson while Charlotte Gulezian proves to be the riot’s sparkplug as the equally defiant young lesbian Peg. Tonatiuh Elizarraraz and Blake Young-Fountain generate the bulk of the laughs as the trash talking BFFs Tano and Mika. Handling all her speeches with fiery rhetoric is Shoniqua Shandai as the one-person militant WILD rebel Roberta (the women’s movement and the Black Panthers both rejected her). Kristina Johnson and Donnie Smith are saddled with stock caricatures of uptight straight white matron and homophobic cop, respectively. Jason Caceres as Newbie, Burt Grinstead as A-Gay and Adam Silver as Cliff really don’t have much to do. There is a live three-piece band above the stage area that performs a couple of original songs by Anna Waronker and Charlotte Caffey to begin and end the show but really just feel like extra padding. Matt Richter’s lighting design is stellar. LALGBT Center’s Davidson/Valenti Theatre, 1125 N. McCadden Pl. in Hollywood. Ends Dec. 13. www.lalgbtcenter.org/theatre or 323-860-7300.